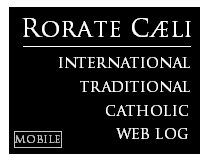 RORATE CÆLI: Progressive Exultation: "This Pope Will Get His Will Done at the Synod"
At the next Synod which will continue the discussion on the family and families, the “parresia” will [have] become total. No second-class theologians, but the Prefect of the Congregation for the Faith in person, has launched a rising “alzamiento” which has also involved cardinals in good faith against what the traditionalists present as a “slackening of discipline”. On the other hand, many extremely prudent prelates have also intervened and who “yield” or “question themselves” when faced with people - wounded by life - but who have not ceased wanting to be Christians. La Civiltà Cattolica has intervened with some essays expressing the Secretary of State’s opinion on the issue. Additionally, the Pope has also intervened on many occasions but yesterday with tones that “reached the peak” of Francis’ ‘meek severity’. 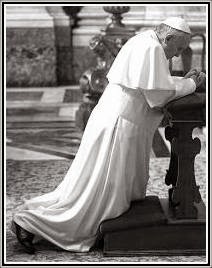 The formal affirmation - according to him - that the divorced and remarried are not excommunicated, presented in the “Bergoglio-style” of a solicitous catechist, touches an essential point. And that is - the statute of rigorism. The rigorists have always excited the admiration of the atheist and the lustful: they seem to be like those who impose “unavoidable” burdens” on the backs of people, and are able to do so since “they are not looking for the applause” of the obviously sinful and weary masses. The condemnation of the rigorists in the Church has always been hard but very clear: in 325 AD, at the First Council of Nicaea, the great Church excommunicated, as it says in Canon 8, the so called “Purists” and sanctioned that those who didn’t give Communion to the digamists, be excluded from the Eucharist. Yesterday, Pope Francis revived the excommunication of the rigorists in his own style: i.e. by saying that the divorced are not excommunicated, means that whoever treats them as excommunicated, is not one who defends marriage, but one who doesn’t understand the Eucharist. If somebody has been thinking of intimidating the Pope, by expecting a “battle” at the Synod, they have either got the wrong picture or the wrong Pope.